Smart serum understands the particular needs of your skin, providing custom repair for the damage you see and the damage you don’t. 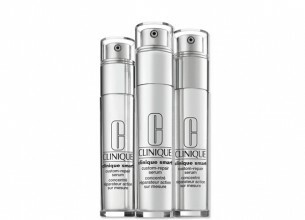 Visibly addresses uneven skin tone, lines and wrinkles, firming, or radiance. Results reflect your skin, your needs. I have only recently started investing in good quality facial serums as I have found that they have really made an impact in the overall improvement of my skin. When the Custom Serum launched, there was a huge hype surrounding it, so before using it I had pretty high expectations of it. I have been using it daily for the last 4 weeks now and so far I am happy with it. I won’t say that I have noticed a major difference in the overall appearance of my skin, but I think over time it will start to show a visible difference. I was surprised by how quickly it absorbed into the skin as it is a much thicker consistency to other serums I have used. After application, my skin always feels hydrated & fresh! The only complaint I have is with the packaging – the bottle is opaque, so I have no way of knowing how much serum I have left.